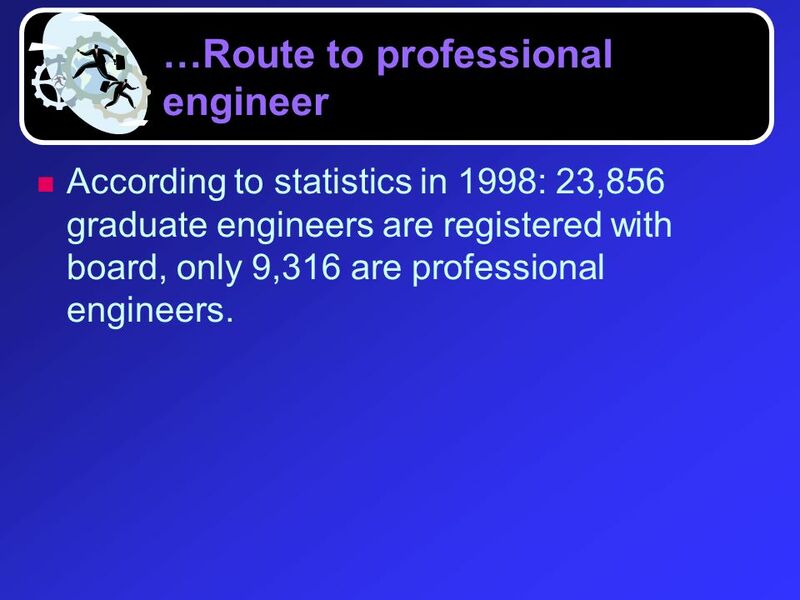 According to statistics in 1998: 23,856 graduate engineers are registered with board, only 9,316 are professional engineers. In the professional interview, the practical experience of the candidate will be assessed by the Examiners both on time and quality basis. 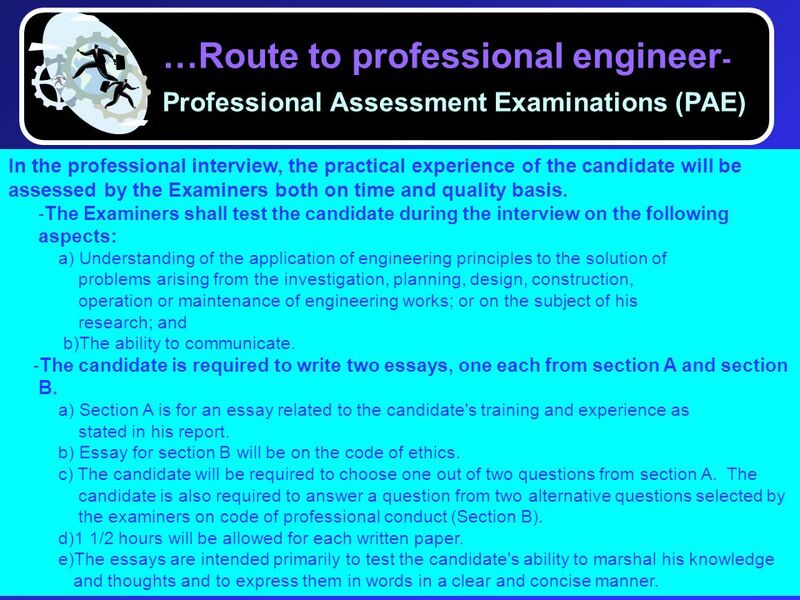 -The Examiners shall test the candidate during the interview on the following aspects: a) Understanding of the application of engineering principles to the solution of problems arising from the investigation, planning, design, construction, operation or maintenance of engineering works; or on the subject of his research; and b)The ability to communicate. -The candidate is required to write two essays, one each from section A and section B. a) Section A is for an essay related to the candidate's training and experience as stated in his report. b) Essay for section B will be on the code of ethics. c) The candidate will be required to choose one out of two questions from section A. 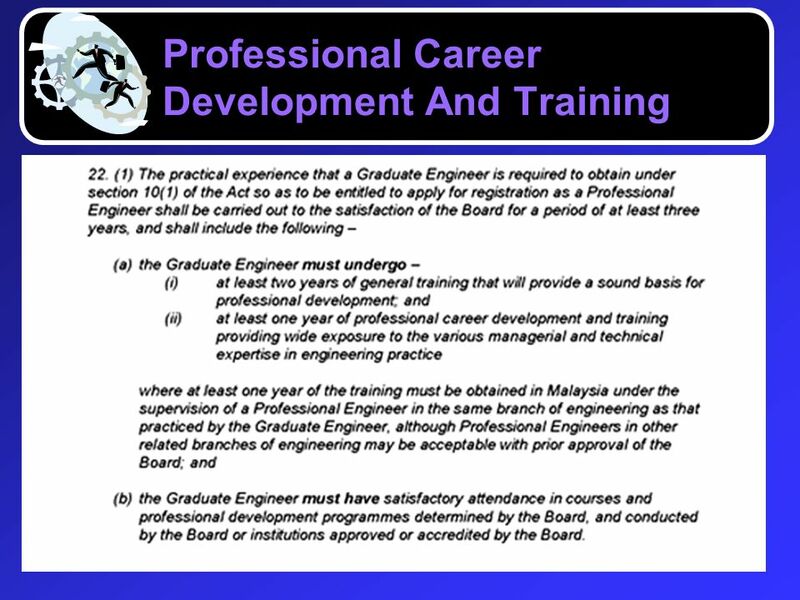 The candidate is also required to answer a question from two alternative questions selected by the examiners on code of professional conduct (Section B). d)1 1/2 hours will be allowed for each written paper. e)The essays are intended primarily to test the candidate's ability to marshal his knowledge and thoughts and to express them in words in a clear and concise manner. 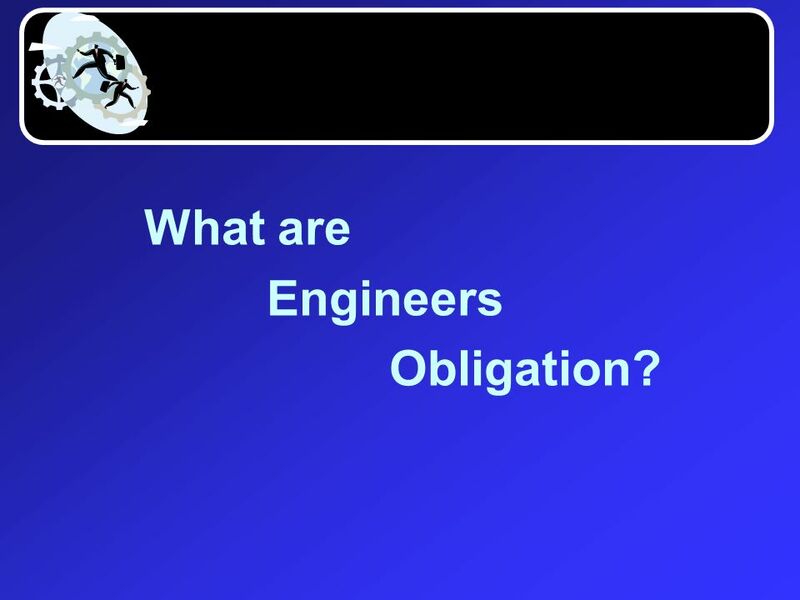 12 What are Engineers Obligation? 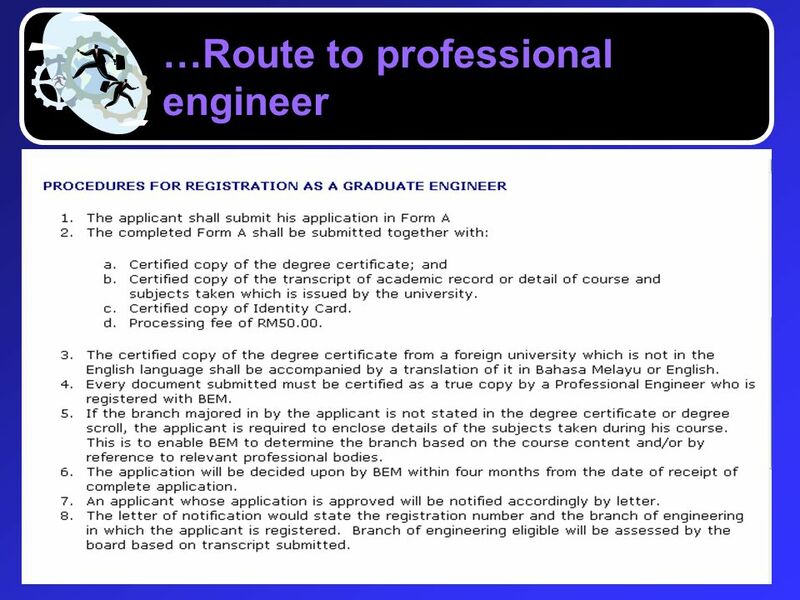 Engineers shall not misrepresent or permit misrepresentation of their or any of their associate's academic or professional qualifications. They shall not misrepresent their level of responsibility nor the complexity of prior assignments Pertinent (relevant) facts relating to employers, employees, associates, joint ventures or past accomplishment shall not be misrepresented when soliciting (requesting) employment or business. Course provided by BEM are Professional Development Programmes Continuing Professional Development course. 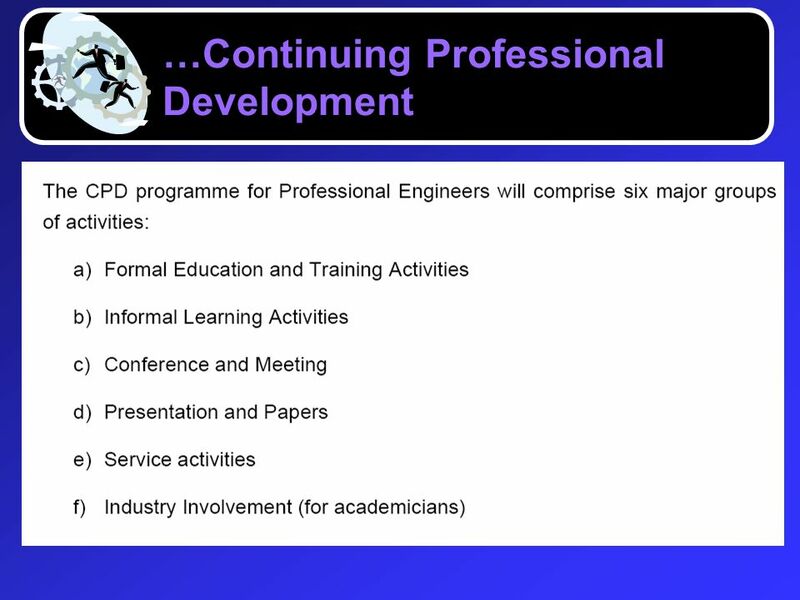 The course name is Continuing Professional Development course. CPD is the planned acquisition of knowledge, experience and skill of personal qualities necessary for the execution of professional duties throughout the working life, which encompass both technical and non-technical subject areas. Engineering provides an ever changing spectrum of challenges and opportunities. 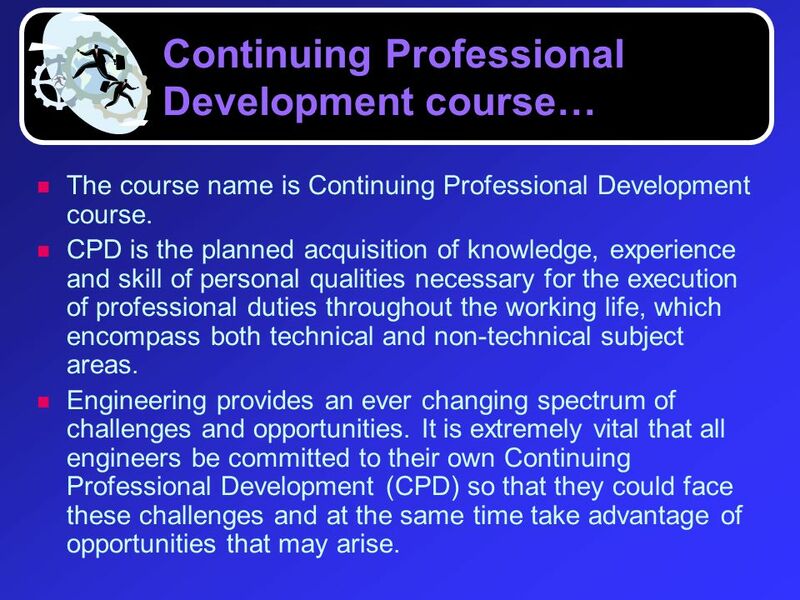 It is extremely vital that all engineers be committed to their own Continuing Professional Development (CPD) so that they could face these challenges and at the same time take advantage of opportunities that may arise. 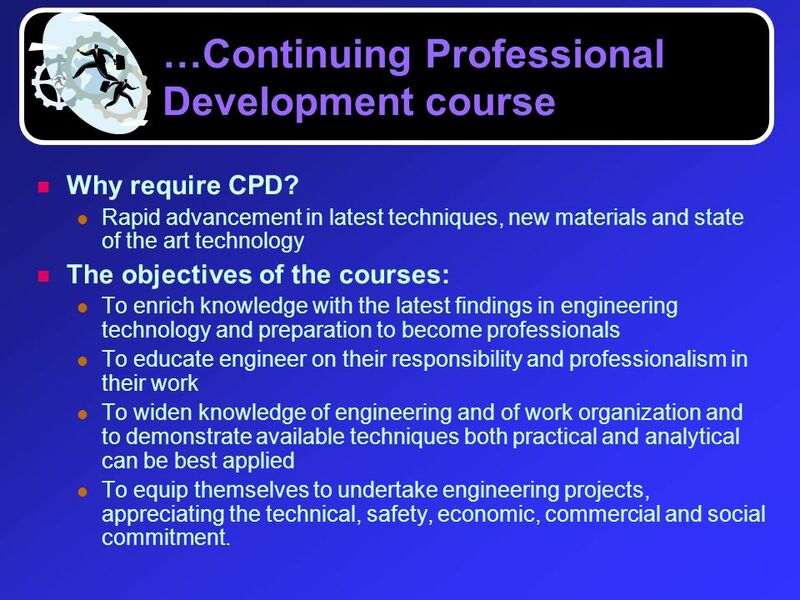 Why require CPD? 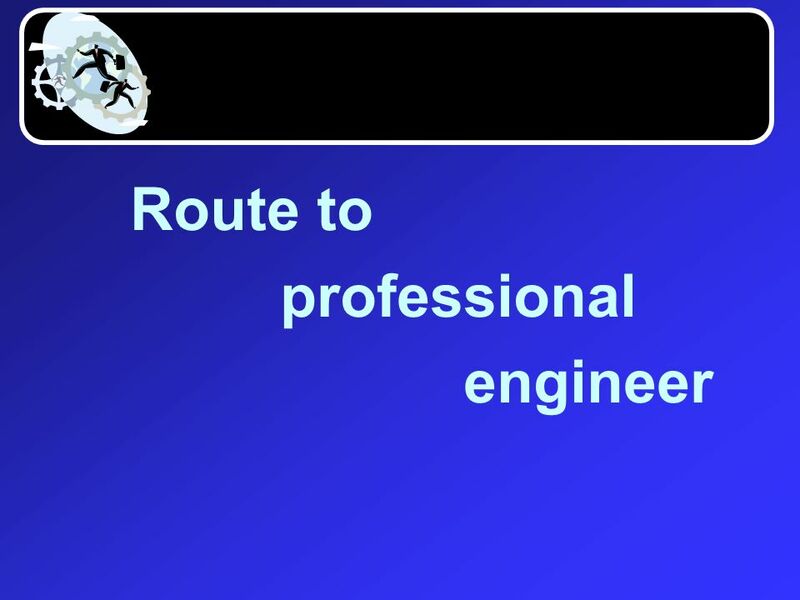 Rapid advancement in latest techniques, new materials and state of the art technology The objectives of the courses: To enrich knowledge with the latest findings in engineering technology and preparation to become professionals To educate engineer on their responsibility and professionalism in their work To widen knowledge of engineering and of work organization and to demonstrate available techniques both practical and analytical can be best applied To equip themselves to undertake engineering projects, appreciating the technical, safety, economic, commercial and social commitment. 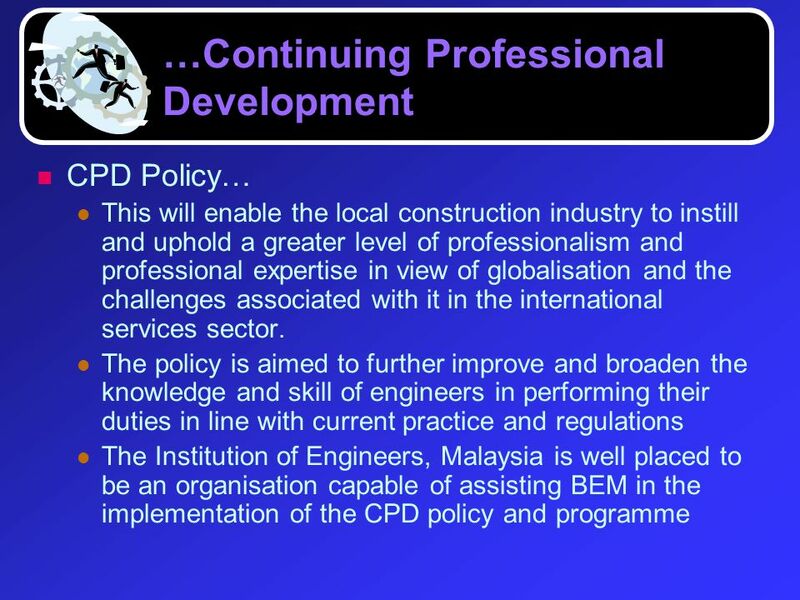 CPD Policy: The CPD requirement will apply to all Professional Engineers. 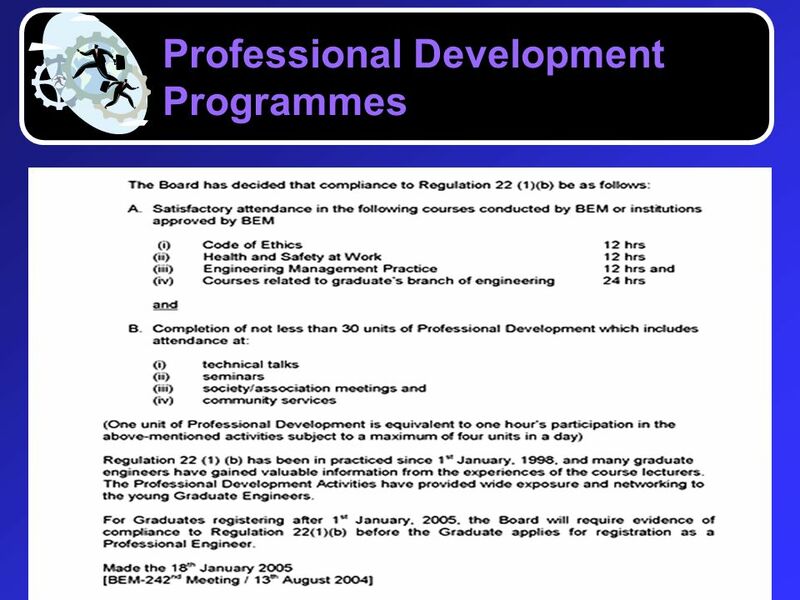 The CPD shall be an average of 50 hours per year over a three year The Professional Engineer may apply to BEM for (partial/total) exemption of CPD requirement. Formal recognition of CPD will be provided by BEM. 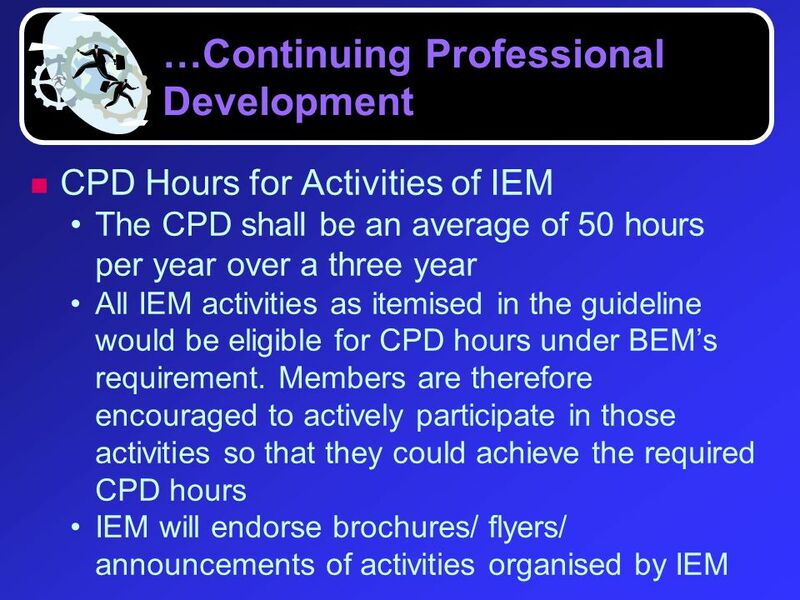 CPD activities will be carried out by BEM or other reputable organizations authorised by BEM The BEM will promote continuing education opportunities. 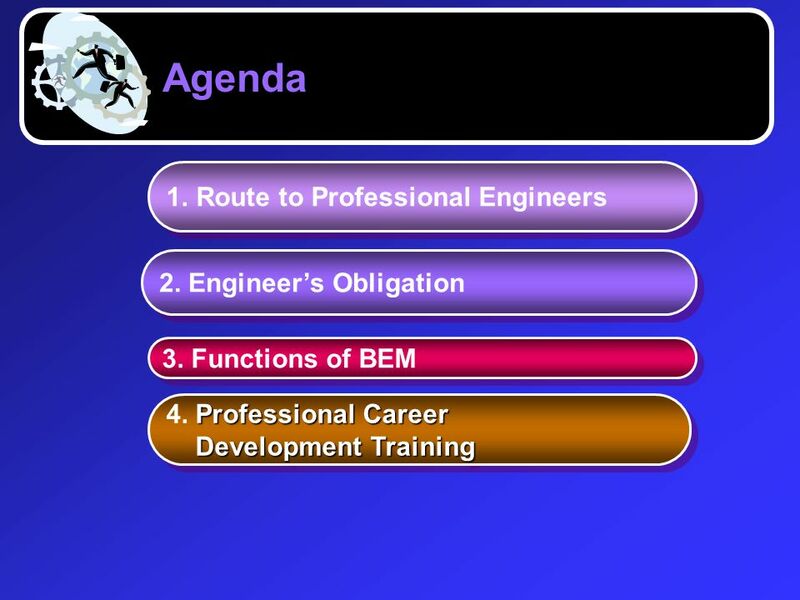 The BEM will promote and endorse CPD courses offered by professional institutions, educational institutions, employers and industry. 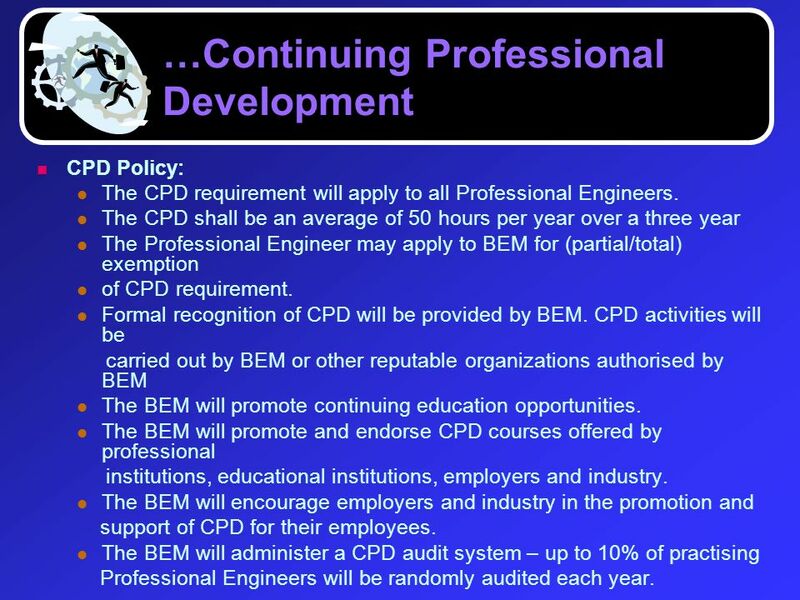 The BEM will encourage employers and industry in the promotion and support of CPD for their employees. 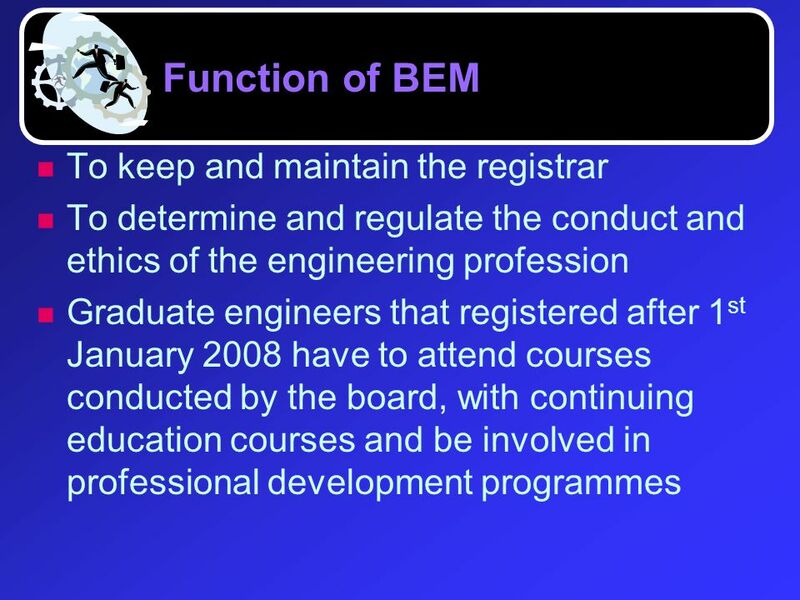 The BEM will administer a CPD audit system – up to 10% of practising Professional Engineers will be randomly audited each year. 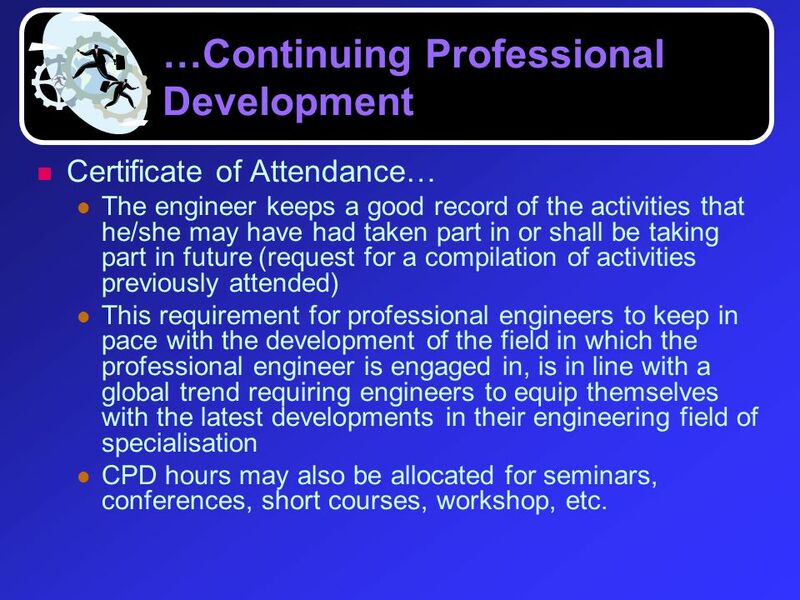 Certificate of Attendance… The engineer keeps a good record of the activities that he/she may have had taken part in or shall be taking part in future (request for a compilation of activities previously attended) This requirement for professional engineers to keep in pace with the development of the field in which the professional engineer is engaged in, is in line with a global trend requiring engineers to equip themselves with the latest developments in their engineering field of specialisation CPD hours may also be allocated for seminars, conferences, short courses, workshop, etc. 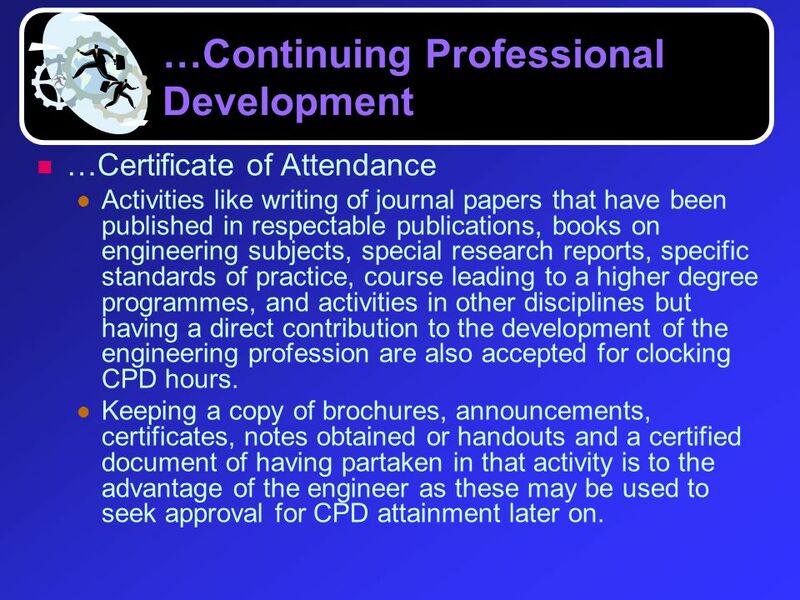 …Certificate of Attendance Activities like writing of journal papers that have been published in respectable publications, books on engineering subjects, special research reports, specific standards of practice, course leading to a higher degree programmes, and activities in other disciplines but having a direct contribution to the development of the engineering profession are also accepted for clocking CPD hours. 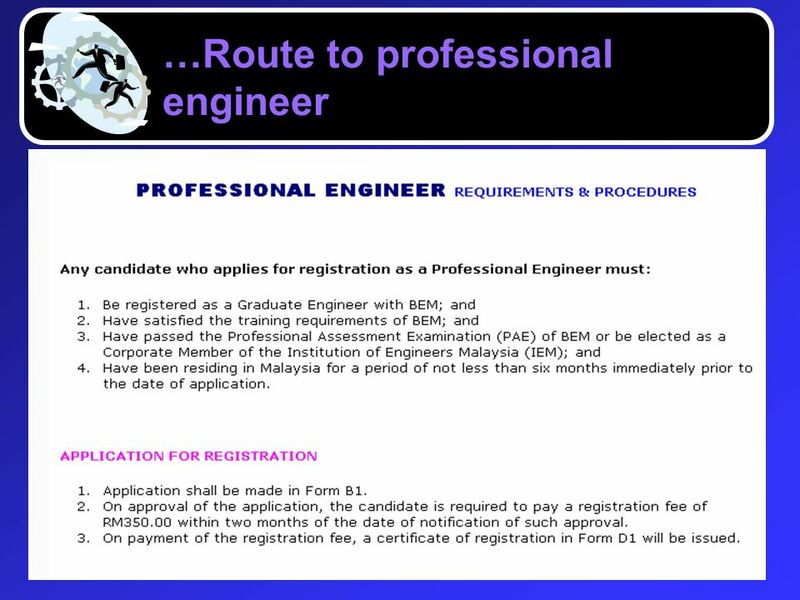 Keeping a copy of brochures, announcements, certificates, notes obtained or handouts and a certified document of having partaken in that activity is to the advantage of the engineer as these may be used to seek approval for CPD attainment later on. 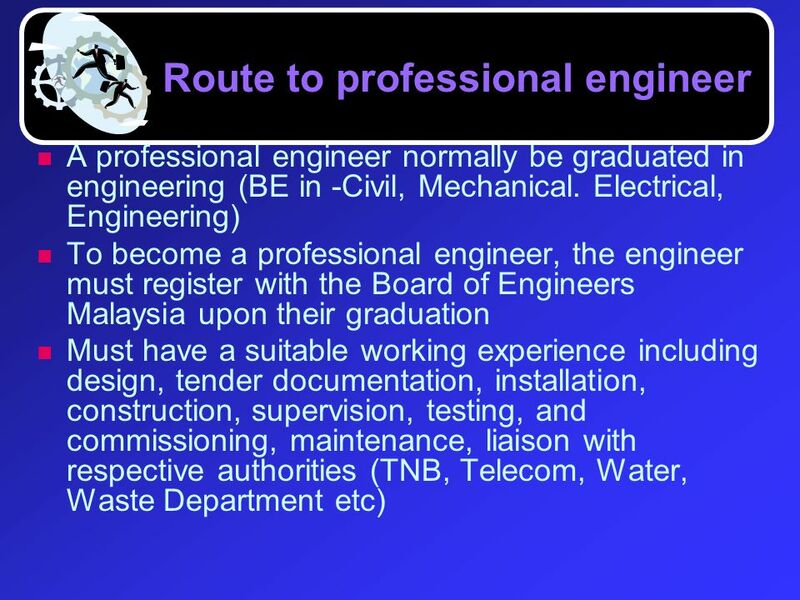 Download ppt "Route to Professional Engineers"
Model Code Of Conduct For Legislative Staff. Code of Conduct for Legislative Staff The Model Code of Conduct for Legislative Staff was adopted in 1995. Professionalism in IT - the UK perspective Susie Kay BCS Director of Professionalism. Assessment Report Computer Science School of Science and Mathematics Kad Lakshmanan Chair Sandeep R. Mitra Assessment Coordinator. 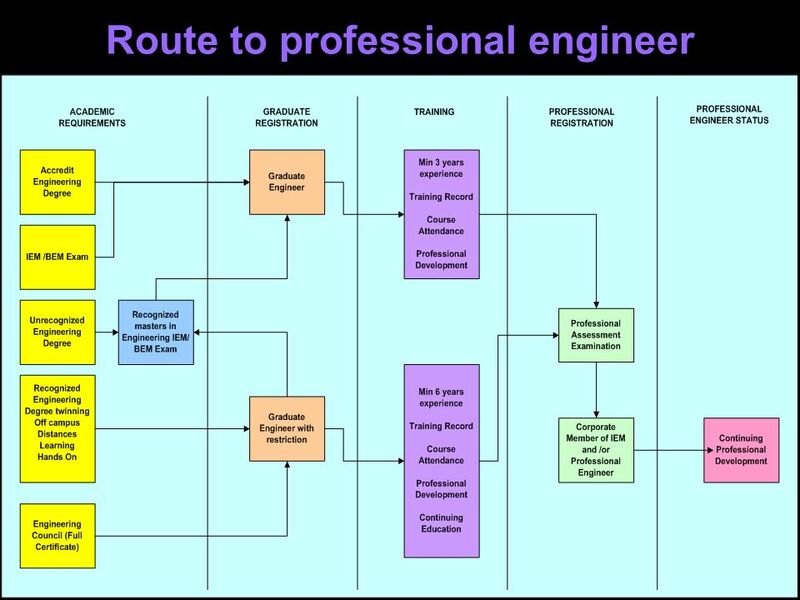 Codes of Ethics The Value in Developing a Code of Ethics for a Profession or in an Organization Module 2 in the “Teaching Engineering Ethics” Series. Engineering Ethics* What is engineering ethics? 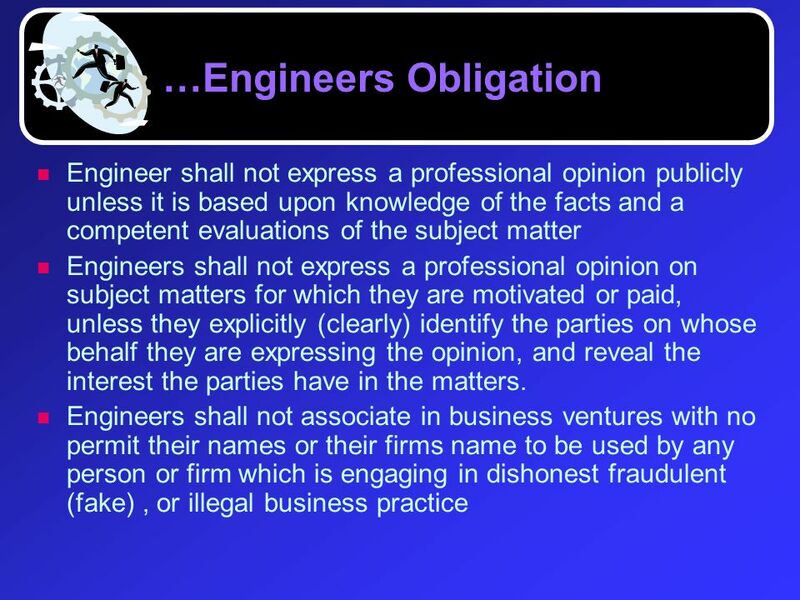 ASME Code of Ethics1 Engineering Ethics Discussion not Lecture Ethics not Morals No person is perfect. Making GOOD Decisions Contractor-Engineer Conference Wisconsin Transportation Builders Association January 31, 2013 Richard Kyte D.B. Reinhart Institute. 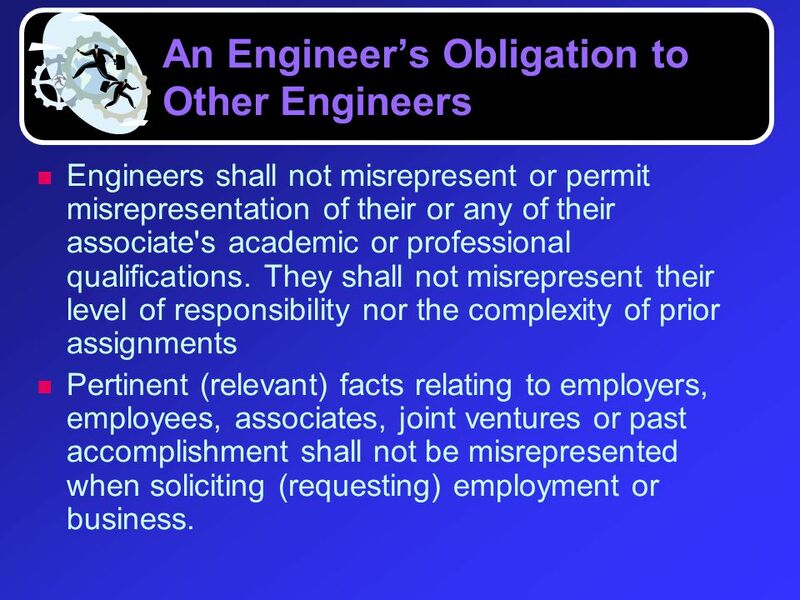 5/5/2015Software Engineering Code of Ethics1 Software Engineering Code of Ethics and Professional Practice Dr. Bob Weber CEG 460 / 660 Wright State University. ICS 417: The ethics of ICT 4.2 The Ethics of Information and Communication Technologies (ICT) in Business by Simon Rogerson IMIS Journal May 1998. Fig. 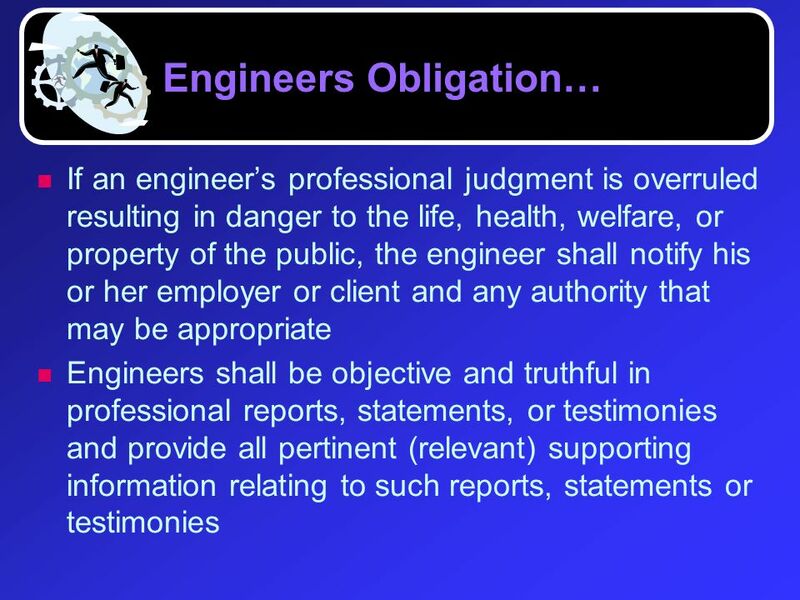 1 An engineer's honesty and integrity provide a shield of protection to the public welfare and safety. In today's world of lawsuits and accounting. 1 Occupational Safety & Health Training Model Joe McNicholas - July 2000. 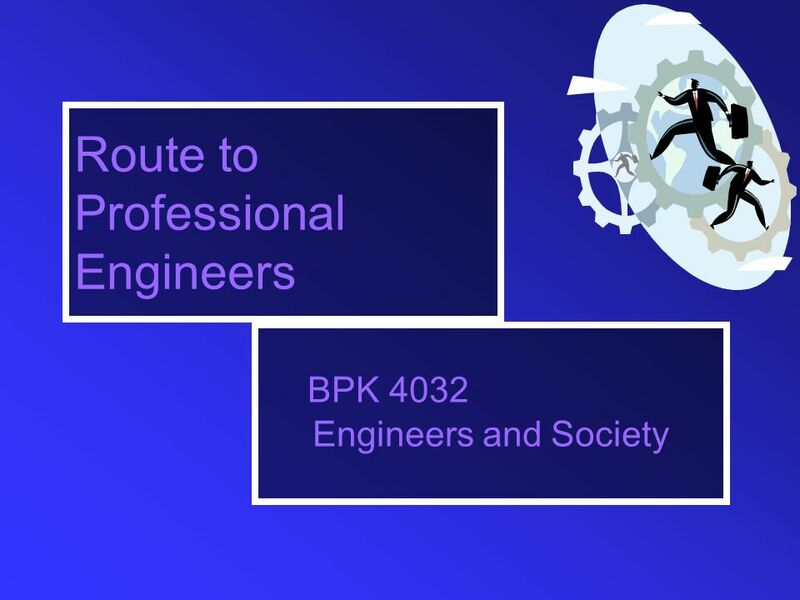 Introduction to the Ethics of Engineering Introduction to Mechanical Engineering The University of Texas-Pan American College of Science and Engineering.  Philosophy of scientific / engineering research. May 2005  Dr. Mehmet Bodur, Computer Engineering Dept. Eastern Mediterranean University  Place and. 1. 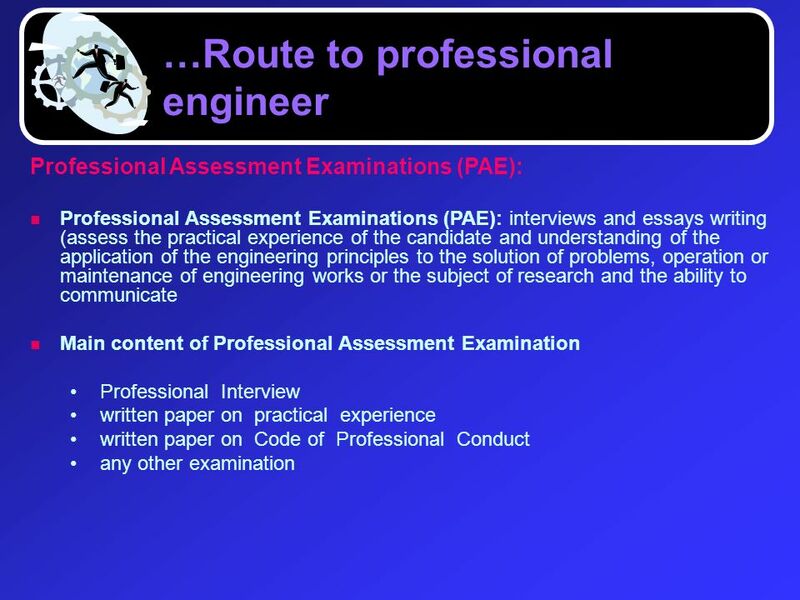 Engineers shall not undertake technical assignments for which they are not qualified by education or experience." To do so would be "faking it." This. 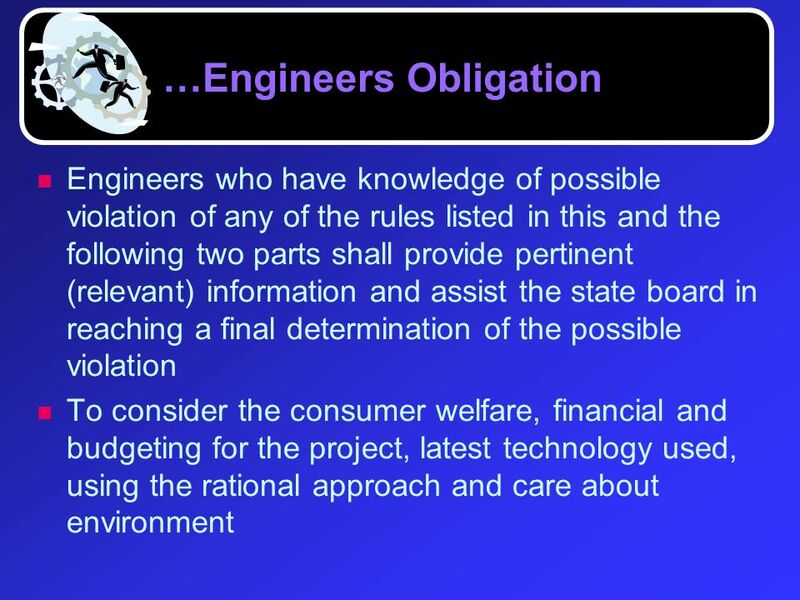 The following code of ethics was adopted by the American Society of Civil Engineers on September 25, The code of ethics became effective on January. ABET’s coming to Rose! Your involvement Monday, Nov 5, 2012.